“To find Majesty in the manger is the miracle. Never allowing the Child to grow up is another thing.” T.J.H. He is God and he is human. He is the Lord of Lords yet the greatest Servant of all. The child of Mary, the baby in the manager; unrecognized by most and honored by few, He is God’s only begotten Son. His public ministry lasted less than three years, yet His mission had been long set in place before the foundations of earth were established. The content of hundreds of ancient prophecies and the very promises of God, He entered the human race in a breathless moment the Scriptures refer to as the fullness of time, the unruly noise of animals and the sweet smell of hay attending his birth. Mary and Joseph kneeling before Him, shepherds called away from their nightly charge, a group of Chaldean astrologers unwittingly led by a cosmic conjunction: Hardly the entourage for the King and Keeper of the universe. But this is God’s way, not ours. Over and over this Christmas season we will see this scene replayed on countless Christmas cards, TV Christmas specials, front yard displays and church Christmas Pageants. We will sing carols and wish each other a Merry Christmas. 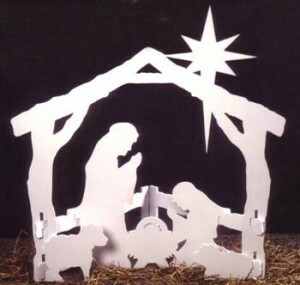 Sermons will be preached and choirs will offer stellar performances of Joy To The World and O Little Town of Bethlehem. We’ll read the story to our families around the kitchen table or lighted Christmas tree. We’ll place statuettes of the principal characters on our mantles or use them as a centerpiece for our holiday dinners. But in the midst of all this warm familiarity, will we see what God wants us to see? Will we see the Greatest becoming so very small and vulnerable? Will we see the humility of Mary and Joseph as they lay aside the world to grasp the things of the Kingdom? Will we recognize in this familiar scene not only the majesty of our Lord but the example He is placing before us? “For who is greater, the one who is at the table or the one who serves? Is it not the one who is at the table? But I am among you as one who serves,” He taught His disciples when they were suffering an identity crisis. And while we live in the deep appreciation and wonder of what He did for us, we cannot forget that it is by this very example He is showing us the pattern for a life that is pleasing to God. Jesus is our Lord and He is also our Great Example. He is the King of Kings yet the greatest Servant of all. The idea seems so incongruous, so upside down, and yet it may be the very thing that will free us into the glorious liberty God has planned for us and make this Christmas a little different than any other.